George Osborne's tenureship of the Exchequer has been notable for the parade of excuses for his economic failures. For the most part it was Labour's legacy; for a short while it was last winter's snowfalls; now it's the Eurozone. It can't be long before he's blaming it on the boogie. New Statesman blogger and former Bank of England Monetary Policy Committee member David Blanchflower has published a piece that shows clearly that the the blame lies squarely with Osborne's economic policy. The recession can be split into four parts. First, the "down" part which started in the second quarter of 2008 and went on for a total of five consecutive quarters of negative growth, during which output fell by an enormous 7.4 per cent. Second, the "up" part, which also lasted five quarters (from Q3 2009 to Q3 2010) when under Alistar Darling and Gordon Brown, growth increased by 2.8 per cent. Then, the "flatline" phase under George Osborne, which is also fifteen months long (from Q4 2010 to Q4 2011) with growth of 0.2 per cent, assuming we use the EU's estimates. 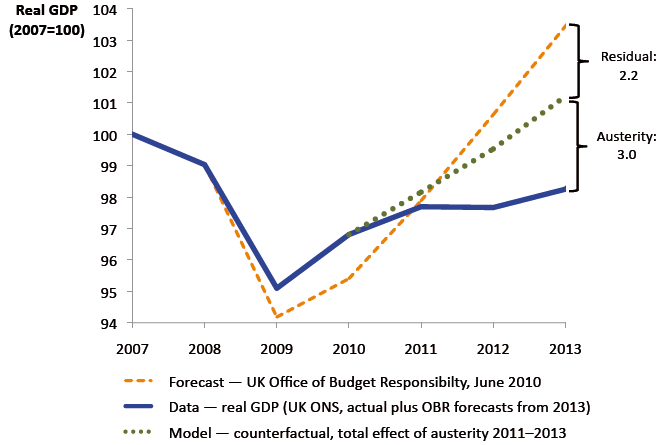 Osborne destroyed Darling's recovery. Then, finally, the "stagnation" phase, lasting 24 months (from Q1 2012 to Q4 2013) with growth of 2.1 per cent over two years, or an average of just over 1 per cent. So by the end of 2013, only 5.6 per cent of the 7.4 per cent drop in output will have been restored. This is worse than the 1930-1934 double-dip recession, which had only a slightly bigger output drop but was over in 48 months. By the end of 2013, this will number 69 months and counting. He concludes that there's no point blaming the Eurozone - the profile of Britain's recession closely fits domestic political decisions. Blaming the Eurozone becomes even more asinine when one reflects that France and Germany are performing rather better than the UK. One reason for this might be that the French and German economies are much more solidly founded on manufacturing, rather than financial services; Osborne, like so much of his party, is a creature of the City and the financial sector in a way that blinds him to the workings of the real economy - assuming that he has the will and the intellectual courage to look. If Britain is at greater risk than France or Germany, it's partly because we have allowed our economy to be far too dependent on the financial sector. It's also interesting to wonder what the effects of the Olympics might be on those numbers - I'd expect they would be worse without the large amounts of public spending and visitor revenues that the Olympics imply. And one of the important implications of these numbers is that they are way worse than the Office of Budget Responsibility's growth projections, which underpin Osborne's deficit reduction strategy (such as it is). This implies that for all the pain of austerity, in Britain - like Greece - there is every prospect that austerity measures will make the deficit worse, at huge economic and personal cost (not that the Tories and their yellow chums appear to care much about the latter). It is looking like a failed strategy whose costs will overwhelmingly fall on the poorest and most vulnerable. The political implications of this are important. It is imperative that the Tories are not allowed to get away with their blame game, or with claims that tax cuts for the rich or (as Blanchflower points out) the frivolities of deregulation will make any difference. Osborne never looks like a man whom nature has fashioned to stand up and take responsibility - he must be called to account. The landslide victory for President Christina Fernandez de Kirchner in Argentina's general election on 23 October provides lessons in both economics and politics for Western governments in the grip of continued economic criss. Her victory comes off the back of a successful economic and social policy based on fiscal expansion, one which has flown in the face of every neo-liberal nostrum. This paper from the Center for Economic and Policy Research shows how, following its default on its debt and the sharp painful contraction that followed, Argentina has not only seen growth that would be the envy of the Eurozone, Britain and the United States but has made huge progress in reducing poverty and inequality, with expanded social programmes producing major gains in public health and welfare. In other words, Argentina has thrown off the burden of debt and turned Osborneomics on its head. It's not surprising that its government has been rewarded with a landslide victory at the polls. There are two important lessons here as the Eurozone crisis develops and politicians call for more austerity. First, it puts the lie to austerity economics imposed by financial institutions and their spokesmen in government. Osborne and Cameron lie about job creation in order to rationalise their economics - in Argentina they've implemented the policies that neoliberals tell us are reckless and they've achieved real economic benefits, widely shared. Second, there is an important message about democracy. In Greece especially, indebtedness is being used to promote the interests of bankers above democracy, in an attempt by lenders to ensure they carry none of the risks of their lending. The risk is instead borne by ordinary people. The Argentinian default threw off that risk, and, importantly, deprived bankers and financial institutions of their powers to subvert democracy. At the heart of the neoliberal programme is the axiom that financial "responsibility" - which means concentrating power in the hands of a privileged minority - trumps democracy. The real lesson of Argentina is that growth, employment, welfare and democracy can go hand in hand. It's unsurprising, then, that neoliberal hegemonists should try to demonise Argentina as a rogue economic state.